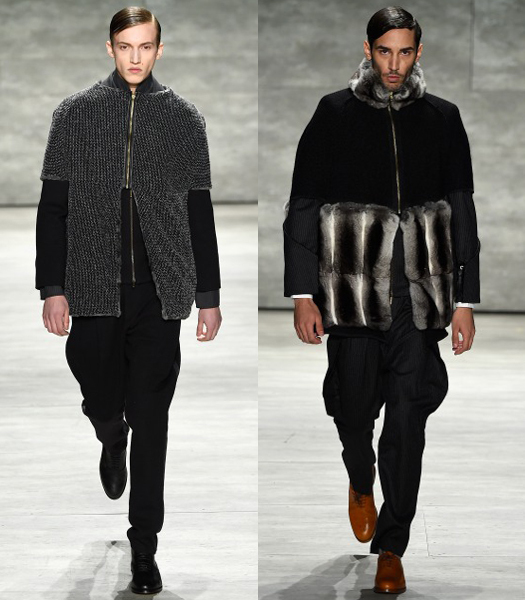 The Basque designer Etxeberria showed his FW15 collection “Poet in New York” at the Lincoln Center, during New York Fashion Week, once again studying classic tailoring of the 20’s and this time being influenced by the Japanese ‘hakama’ pants. 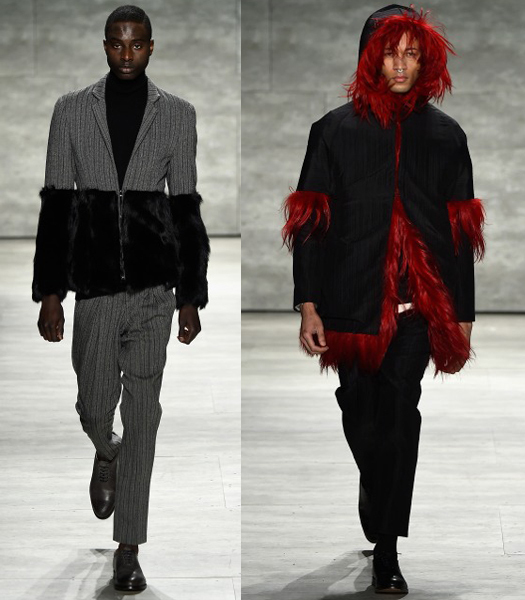 Albino models Shaun Ross, and Diandra Forrest walked the runway again for Etxeberria. The show was choreographed and directed by Jermaine Browne. 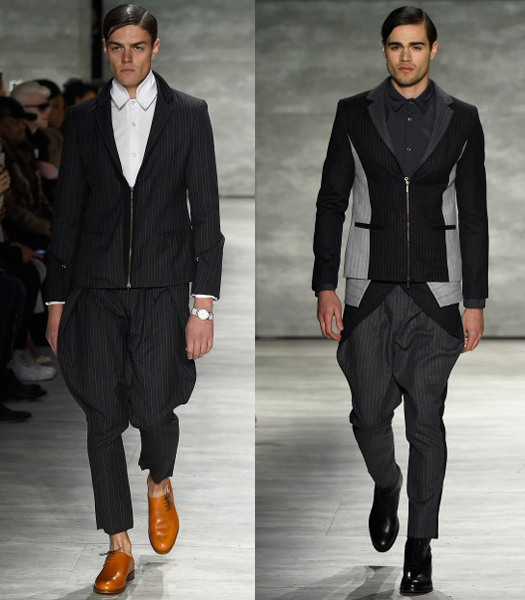 The designer focuses on interplay of volumes and loose silhouettes with minimum seams and pleats. He creates minimalist shapes of architectural and textural value. 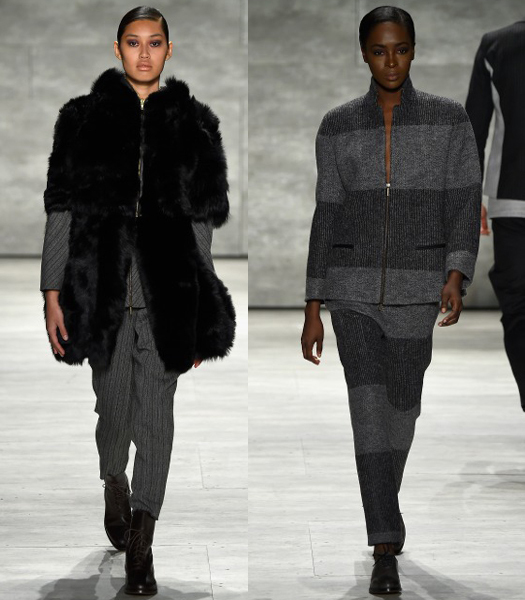 He modernizes the art of tailoring and uses a basic palette of neutrals to create a very extravagant, yet wearable winter wardrobe. British tailoring and 20’s eveningwear, as well as Neapolitan tailoring from the 50s, are major sources of inspiration. He combined fine quality wool and felt with leather and fur – his favorite materials – to create warm and hip stunners of eclectic nature. I was rather impressed with the intricate mix of classical motifs such as herringbone, pinstripe, houndstooth and jacquard, as well as the smart use of accessories. Both men’s and women’s oozed confidence and edginess but at the same time an easiness and softness that people are looking for during colder months. The all-white fluffy, feminine and chic coat, at the finale of the show, as well as the striped grey looks for men were eye-catching and absolutely desirable!